Three experts on the subject of Yellowstone’s geysers weigh in on the provenance of the geyser cone displayed in Washington, D.C. But the evidence is contradictory. Lee Whittlesey, Park Historian, supplies the following: Geologist Walter Weed, in his 1883 field notebooks, wrote that Superintendent Norris told him he had taken the cone from Vixen Geyser in Norris Geyser Basin. Whittlesey also says that Norris himself, writing in his 1881 report, mentions that the specimen came from “a secluded defile.” Norris Geyser Basin might indeed have been considered secluded in those early days of the park. Supt. Norris wrote in one of his annual reports that he took the specimen from a pulsatory spring, that is, one that erupts continually or very frequently. Avalanche erupts about every 8 or 9 minutes for 2-3 minutes. The location given in the Norris report could describe that of Avalanche Geyser. Avalanche looks today like rocks had dropped (or been dropped) onto it from the hillside above. Note that Bryan mentions 17 vents—as does the Smithsonian’s label—and says that the form that this geyser’s deposit takes is spiny and the geyserite is pale brown. Moreover, Vixen Geyser is not located in a defile or gorge, but Oblique/Avalanche definitely is (as shown in a picture in Bryan’s book, page 326). Although Rocket Geyser is pictured in the Smithsonian’s case with the purloined geyserite cone, no one is suggesting that the cone came from that geyser. The minerals department at the museum has no record of where Norris might have got it. The plot thickens when a few more historical facts are considered. In Norris’s 1881 report, he says he took the specimen from “two miles above the Paint Pots”—which Whittlesey, in his Wonderland Nomenclature, takes to be the Artists’ Paintpots. The Geyser Creek hot springs are not more than one mile from the paintpots. Norris had opened a road through the Geyser Creek area in 1878 (this road is now an unmaintained trail). Thus, taking Norris’s supplied information into account, Oblique would have to be ruled out, because it is much closer than two miles to a (former) road. Using a topographic map and taking the paintpots as the center of a two-mile radius, the only other thermal area that might fit Norris’s description is Sylvan Springs, across Gibbon Meadows northwest of the paintpots. But the Sylvan area is at about the same elevation as the paintpots, not “above” them. What’s more, those who have been there say there is nothing like a “secluded defile” at Sylvan Springs. 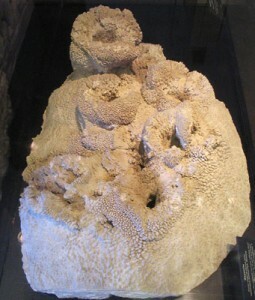 ON THIS WEBSITE: See the first part of this story: A Yellowstone Rock in the Smithsonian, Part I. IN THE GUIDEBOOK: Read about the trail to Artists’ Paintpots on page 287 of Yellowstone Treasures, fifth edition.